Without question, the one I’m most proud of is the replica of Shea Stadium during the 1974 season. I spent a lot of time researching and feel this reproduction is more than worthy for my tabletop. Going down memory lane, my first replay was the 1968 AFL season using a card set that I purchased on EBAY from some stranger named, Mark Zarb. I followed that up with a replays of the 2006 AFC, 1967 AFL, 1974 AFC, 1968 AFL (again), 1997 Green Bay Packers – Denver Broncos (mini replay), 1968 NY Jets – Baltimore Colts (mini-replay), 2007 New England Patriots – NY Giants (mini-replay), 2008 AFC, and finally 1981 NFL replay. During this time period I was fortunate enough to stumble upon a thread by a fellow named, Jim Fraasch, who was selling customized APBA envelopes. Needless to say, Jim’s envelopes have been gracing my table top for the last 10 years and I’m proud to call Jim a friend. It was during my 2011 NFL replay that I came across a two different threads that completely changed the appearance of my tabletop. The first thread was by a gentleman named, Grant Baker, who created all the modern NFL fields. The second thread was pure gold, Art Hall did the graphic design of fields ranging from the 1960s to late 1990s in all different weather conditions. Art and I routinely email and I consider him a friend. I was determined to transform these images into an APBA style football field. Well after several failed attempts and multiple print and sign shops later, I finally had a prototype. From that moment on my tabletop never was the same. Oh, and that stranger I mentioned earlier, has become family and is the beneficiary in my will for all my fields and NY Jets memorabilia (no joke). On the sidebar directly under the search field, is a new widget titled “Oguard62’s Tabletop”. I’ve posted images of the envelopes and fields that have been used during the following replays: 2011 NFL, 1967 AFL/NFL, 1985 NFL, 1969 AFL/NFL, 1999 NFL, 1998 NFL and vintage fields from yesteryear. 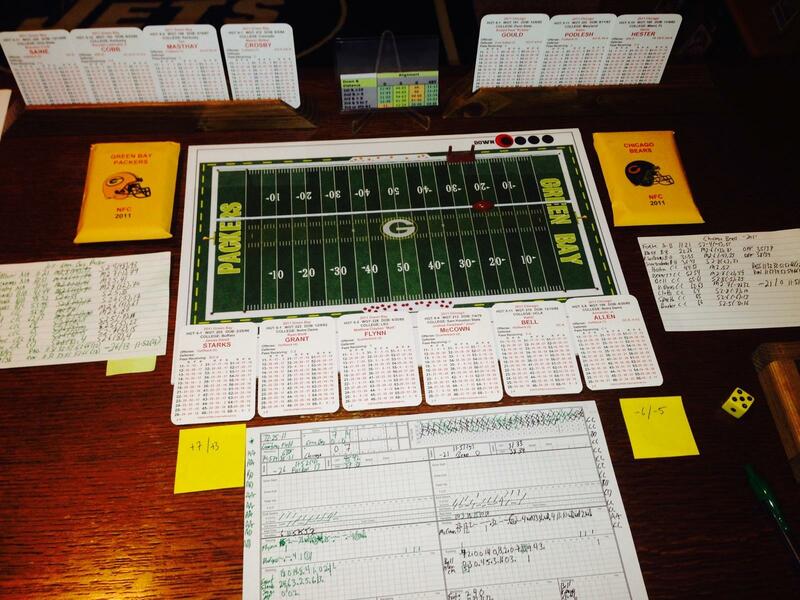 Mark Zarb carded the 1972 NFL season and is currently doing a tremendous job replaying this campaign. As a token of my appreciation, I had Shea Stadium re-created to mirror its appearance of the late 60’s and early 70’s. The above photo is overhead shot of his table-top moments before kickoff of the October 5th, 1972 game between the Miami Dolphins and the New York Jets. If curious, the multi-colored charts are re-keyed from the Master Game booklet. For most of the Jets’ tenure at Shea, they were burdened by onerous lease terms imposed at the insistence of the Mets. Until 1978, the Jets could not play their first home game until the Mets’ season was finished. For instance, in 1969, the defending Super Bowl champion Jets didn’t play a home game until October 20 due to the Mets advancing to (and winning) the World Series. This fact I’m quite aware of since I’m currently replaying the 1969 season. Mark’s game last night was the first one to be played on this field and what a game it was! I felt like a ten year old boy again listening to Merle Harmon call play-by-play each time I received an update via text. I highly recommend reviewing Mark’s historical/replay synopsis, scoring summary, team and individual statistics of this game between two rival divisional foes. 1. Transfer files to memory stick. These files have already been published into PDF Format so they can be edited and can be found on the sidebar of this site listed under the “G. Baker’s Fields” widget. 2. Instruct their “Graphic Designer” to customize the artwork to meet your needs. (i.e., Create “First Down” circles, remove unwanted text, etc). 3. Fields need to be single sided prints on 11 in (H) x 15 in 3mil Calendered Vinyl stock material. 4. Fields need to be mounted on PVC – 3MM Black 48 x 96, PVC – 3MM Black 48 x 96. 5. Fields need to be laminated with Lamex 4mil OverLaminate on face. 6. Recommend you bring an APBA Football & first down marker with you and specifically instruct them how you want the two cuts done. I require the tip of the football rest on the upper hash marks (rough estimate is 1/4-inch above) and the first down marker on upper sideline boundary. 7. Don’t go to full production until you are completely satisfied with the prototype. I recently picked up my 1960 style fields from my local sign shop. These classic football fields were created by Mr. Art Hall. Art has created several college conferences (Big Ten, WAC, Conference USA, etc) and all of the AFL and NFL fields from the 60s. In addition, he has created numerous NFL fields from 1970 through the 1990s. Each image created chronicles the changes of each franchises field over the decades. Outstanding effort!! I emailed Art and briefly explained my intentions of transforming his fields into APBA style football fields for an upcoming replay of mine. Upon his return from a hunting excursion, he converted all requested fields into PDF format and posted them on a Media Fire account for me. Art went out of his way to assist me and I couldn’t be more appreciative. Below I have posted an image of Shea Stadium and Fenway Park. If you look closely you can see that the goal posts are positioned in the back of the end zones. This is not historically correct, up until 1974; all goal posts were placed on the goal line. This error is not Art’s doing, all of his fields come without goal posts. The programmer at my local sign shop evidently took Art’s fields and cropped them onto the existing template used for my modern fields. For one, the young gentleman wasn’t aware of who the Los Angeles Rams were, need I say more. 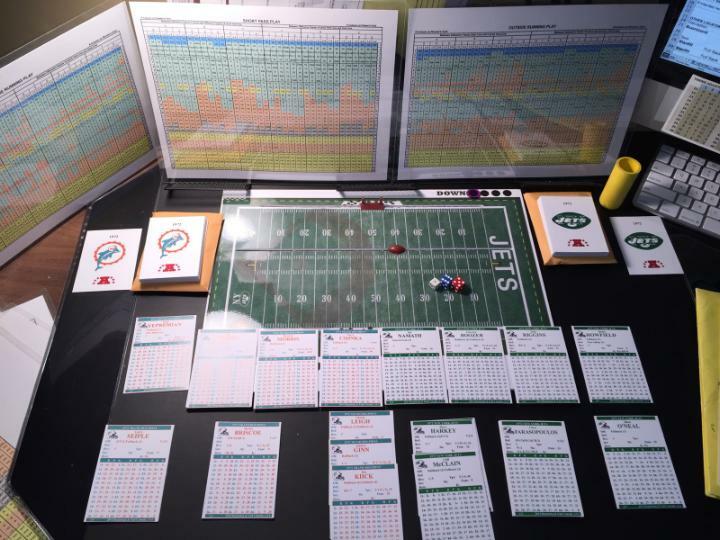 However, the main reason that I went through so many prototypes was to determine the exact size the field had to be for the APBA style first down marker to be exact. So this is the primary reason for the historical inaccuracy, I hope Art doesn’t hold it against me. Proceed to below link to access several of Art’s fields. About a month ago, I noticed a thread titled “Free!! 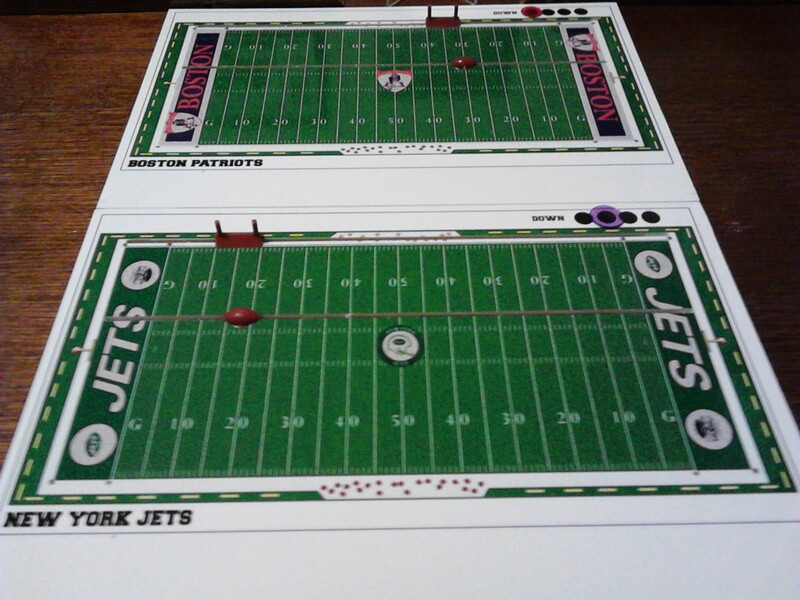 Printable NFL football fields” on the Table Top Sports forum. Mr. Grant Baker was kind enough to share his work of art with the gaming community with only one stipulation, “These are for personal use and can NOT be sold under any circumstance.” These modern NFL fields can be found on the sidebar listed under “G. Baker’s Fields” widget. The minute I laid eyes on these fields, I knew that I had to have these developed into APBA style football fields. I wanted something sturdy that wouldn’t move easily, worked with existing first down marker/football, ability to track downs, had a protective surface and most importantly was “playable”. To make a long story short, in my quest I had to hire/fire one sign shop and went through multiple prototypes until I was satisfied. My decision not to have the fields trimmed/cut around Grant’s outline was two-fold, first, it was a cost-saving measure and secondly, I use the ledge for placing skill players on the gridiron.